Let us be your Guide around this mesmerising island and inspire you to explore every corner of this diverse Greek treasure. 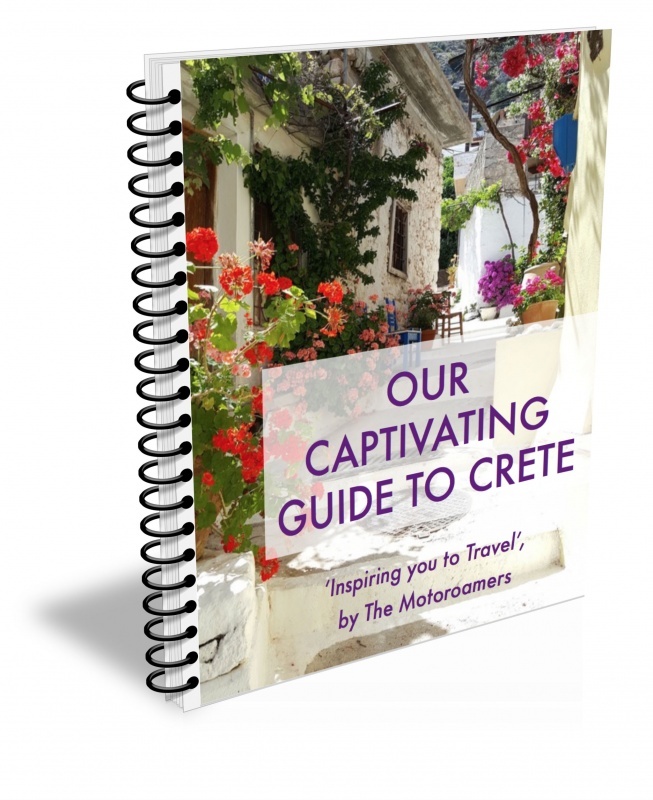 Whether you arrive with a tent, travel over in your own motorhome or fly and hire a camper, Our Captivating Guide to Crete, will help make this as memorable a trip for you as it was for us. Click the book image to download and save your FREE copy, now! Greece is one of those places of Europe that really does live up to those iconic Travel Magazine photos. Sparkling azure seas, golden sands and enough ancient history to make you see the enormity of evolution. It is a chocolate box of incredible adventure, exploration and relaxation. What about Crete, have you ever ventured there? If not, then this Guide is just for you. Crete is the largest of the Greek islands and the furthest south and to really experience it fully, time is of the essence. We had a month and didn’t get to see it all, although it has given us a great flavour of what this special island has to offer. Practical information about getting to Crete, getting around and life on the island. So why not download and save this Guide, for FREE with our love. Our passion is to inspire you to travel when you can, however you can for as long as you can. And we genuinely hope that after reading this Guide, that Crete will be on your wish list. Download it for FREE and SAVE it to your device for future reference. Just click any of the book images on this page.